Ever find that your site isn’t loading? Blank page? HTTP Errors? You can then follow through with this guide and troubleshoot to fix your WordPress domains. A general rule of thumb when you are troubleshooting your WordPress domains is to always check what is appearing in your error_log first. You will generally find what is causing your site to malfunction and throwing error codes in this log. First log into your domains cPanel. You will then want to open your File Manager. From here, you want to then go into your domains public_html folder. You can do so by double clicking the entry or expanding it on the left. When inside your public_html folder, you should now be able to find your error_log file. Hitting View at the very top will now allow you to see the errors contained in this log. There’s also an alternative error log found in cPanel itself. In your cPanel if you scroll down, you are able to find an icon under METRICS that says Errors. By clicking this, it will open another page that will show you the last 300 error messages your site has thrown. The key errors you are looking for when troubleshooting your domain are related to themes and plugins. They will contain the following at the end of the error – /wp-content/plugins OR /wp-content/themes. If you are seeing errors like this, keep following the guide below to hopefully correct them. Plugins are one of the most common problem makers when it comes to WordPress. If a plugin isn’t compatible with your current WordPress version, it can potentially stop working, and cause slow downs or even cause your site to stop loading completely. A quick rundown of troubleshooting plugins is below. This will then log you into the admin back end of your WordPress installation. From here we will now go straight to Plugins by clicking on it on the sidebar. As you can see, I currently have ShortPixel Image Optimizer as my activated plugin, for the purpose of this guide we will act like it is the example conflicting plugin causing problems with our domain. To deactivate the plugin, simply click Deactivate found under the Plugins name in the list. This will now have deactivated the plugin, and you can check if your site now loads. If it does, then you have found the culprit. The more plugins you have, generally the higher chance of conflicts occurring. Deactivating plugins one by one until you find the problem one is your best bet in that scenario. Your second option to removing a broken plugin is to rename the plugins folder in your cPanel’s File Manager. Open your File Manager, and then navigate through to your public_html/wp-content/plugins directory. Once here, you will want to Rename the plugin folders you currently have installed. Adding a – to the end works fine. Alternatively, you can Delete them. Upon renaming or deleting your Plugins folder, refresh your site and see if it loads. If it does, you have found your issue. If the WordPress plugin you’ve installed has locked you out of WordPress admin, the other option you have is to go into the FTP of your server and rename the plugin folder to something different. We have also created a guide on FTP’ing into your server. Click here to go to it. The plugin folders on your domain will be located in public_html/wp-content/plugins. Once you have renamed your problematic plugins folder, WordPress won’t load it on next site load. You can then delete the plugin from your WordPress admin dashboard or simply delete the plugin folder in your FTP. Another major conflict issue with WordPress is themes. There are many themes available for WordPress, however that does not mean they are all still compatible with the specific WordPress install you have. There are also chances of errors occurring when you update to a newer version of your themes. This can corrupt files, and lead to your domain throwing errors at you. I will show you how to delete themes from your domain below. Once you are at your Dashboard, you want to click Appearance on the sidebar. You will now be shown the themes that you have both Active, and installed on your domain. Active is the one that your domain is currently using, your installed ones will appear beside this. From here, simply switch to another theme such as the default Twenty Seventeen found in the screenshot above. Do so by hovering your cursor over it and clicking Activate. If your site now loads without chucking an error at you, you have found a problematic Theme. Try using another one and see if the error replicates. Your second option to removing a broken theme is to rename the themes folder in your cPanel’s File Manager. Open your File Manager, and then navigate through to your public_html/wp-content/themes directory. Once here, you will want to Rename the theme folders you currently have installed. Adding a – to the end works fine. Alternatively, you can Delete them. Upon renaming or deleting your themes folder, refresh your site and see if it loads. If it does, you have found your issue. If the WordPress theme you’ve installed has locked you out of WordPress admin, the other option you have is to go into the FTP of your server and rename the theme folder to something different. The theme folders on your domain will be located in public_html/wp-content/themes. Once you have renamed your current themes folder, WordPress will then load the default theme. You can then delete the problematic theme from your WordPress admin dashboard or simply delete the theme folder in your FTP. Depending on the themes you’re using, your site also may not load due to the theme requiring a newer or older PHP version. To switch your PHP version, you can find the option to do so in the main section of your cPanel. Log in to your cPanel and scroll down to the following section named SOFTWARE and click Select PHP Version. From this screen, you will be able to select the PHP version your domain uses by using the drop down menu. Generally the default PHP versions can vary, but we recommend switching between 5.4 to 7 to see if you can get any results. 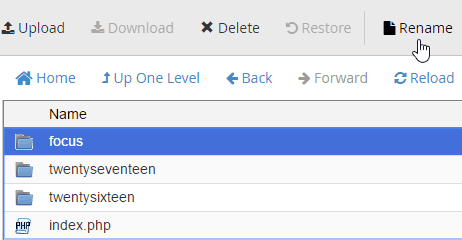 Click Set as current to switch versions. ModSecurity can sometimes cause problems with WordPress due to the restrictions it implements, resulting in an error that simply says permission denied. We recommend that you try to also disable ModSecurity when troubleshooting to see if that fixes your permission issues. Finding ModSecurity is simple, it is located under the SECURITY section found in your cPanel. To disable ModSecurity, click the Disable button as shown below. You can now try loading your site. As a precaution, remember to Enable this option again if it is not the conflicting issue with your domain. If you’ve troubleshooted your site by yourself and found that none of these solutions have fixed the issue, we recommend that you go to a service such as WP Fix It. Alternatively, you can find someone on Upwork to help you.